The University of Technology, Sydney is a city campus known for its brutalist architecture. Opportunities for socialising in a landscape setting are limited. 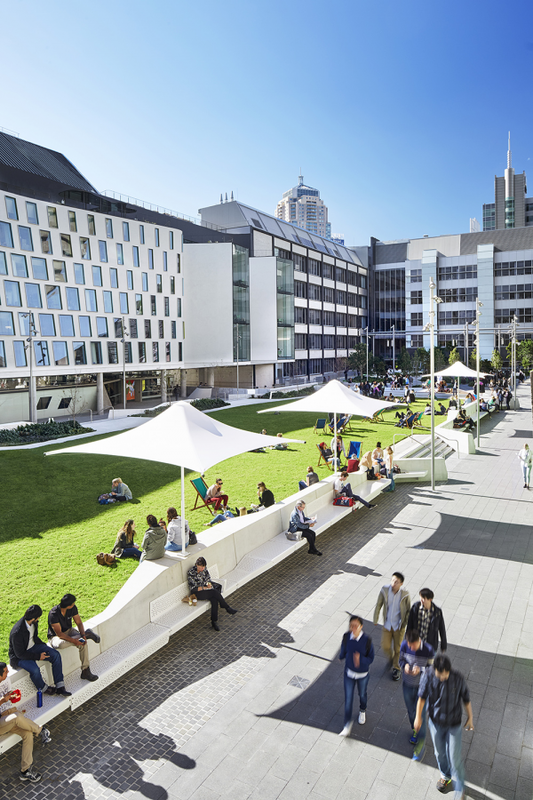 The Alumni Green was a unique opportunity to transform the campus by providing an oasis at the heart of the campus, creating a human centrepiece for UTS. 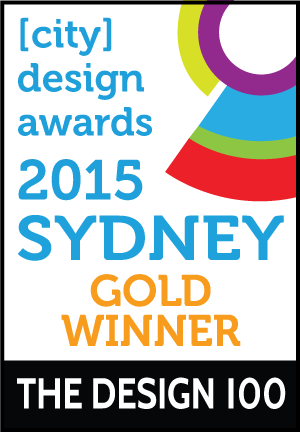 The new space is a vital piece of green infrastructure in an otherwise highly urbanised part of the CBD. 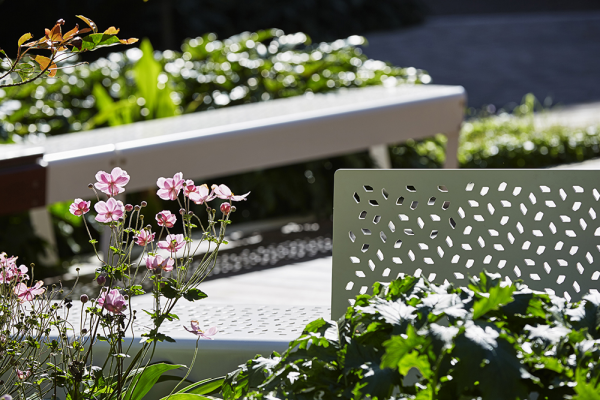 - The Garden, a series of richly planted 'pods' or rooms, which are designed to provide intimate scaled activities and programs, such as studying, playing table tennis, eating lunch in a garden setting. 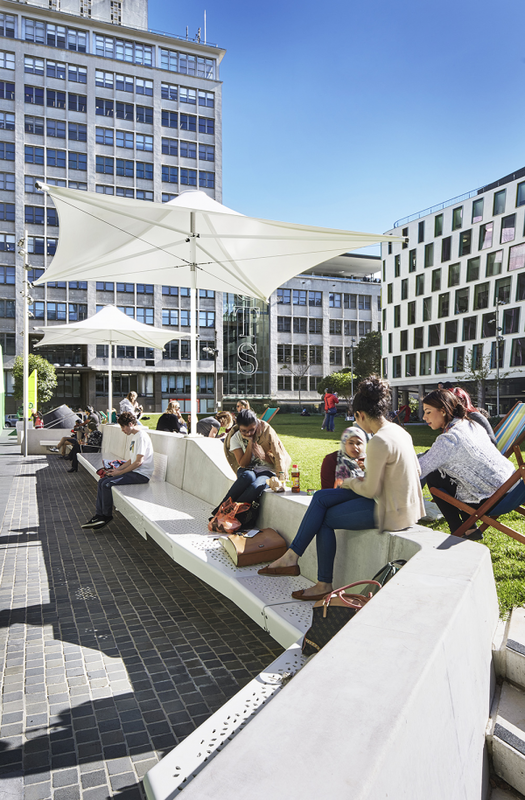 By prioritising the ‘social infrastructure’, the design of places for people to work and to socialise, the UTS Alumni Green has become the social heart of the campus: a place where people want to work, stay, be and play, creating a ‘sticky campus’. 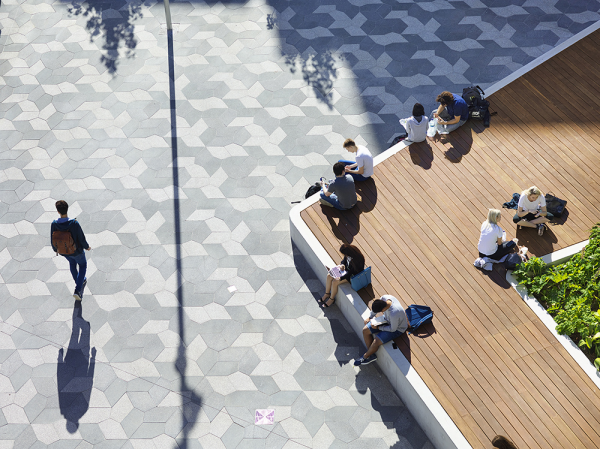 The core principle that has guided the design of the UTS Alumni Green from concept design through to completion is that People are the centre of the university. 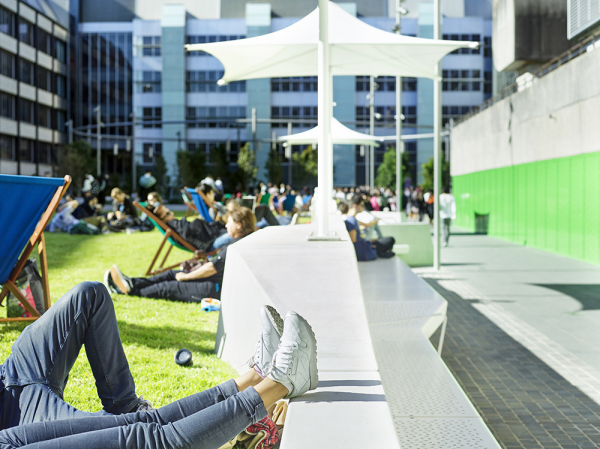 Prior to the redevelopment of the Alumni Green, the UTS City Campus was characterised by a disparate collection of buildings with extremely limited opportunities for students to gather and spend time valuable time on campus, outdoors. 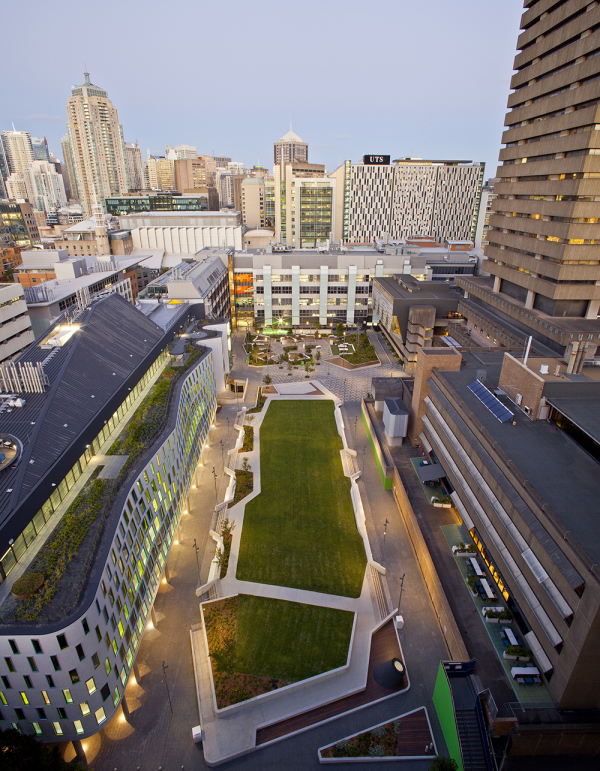 The brief for the Alumni Green identified the need to revitalise the campus; to create a 'sticky campus' - a vital, connected campus that would draw the UTS student community back to the campus and for the first time create a true heart to the university. Putting people at the centre of the university requires the development of ‘social infrastructure’, the suite of physical elements that facilitate socialising, studying, working and playing. These are the elements - the mid morning sun trap close to the coffee place, the comfortable seat or the great study spot - that make the space truly 'sticky', that make it memorable and make students want to linger and to return to the space again and again. The design of the Alumni Green was undertaken with the ambition of creating a truly human centred place. Every detail, every level change, every move was tested to ensure that it was providing an opportunity for people to engage with the space. The technical constraints of building a new landscape on top of a library required a truly collaborative, multi-disciplinary design and engineering process. 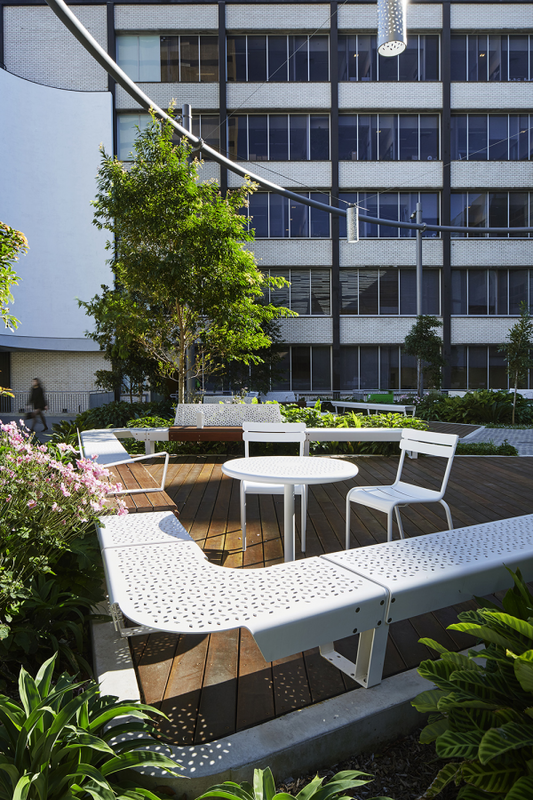 The suite of public furniture, as well as the 5 sided custom paver and all of the long double-sided precast benches were designed specifically for this project with input from local, Australian manufacturers. The custom nature of these elements ensure that the Alumni Green is a genuinely memorable space that provides site-specific design solutions and social infrastructure that truly responds to the needs of the users. ASPECT Studios also worked with the university to develop a placemaking strategy which resulted in a combination of curated moveable and temporary elements. The strategy involved procuring fixed umbrellas, moveable chairs, deckchairs and rugs to be positioned throughout the Alumni Green each day. 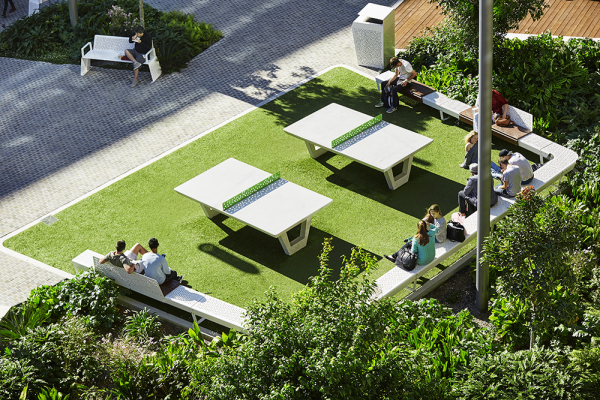 The process of being able to customise the user experience, by providing moveable furniture, has added a new layer of engagement to the Alumni Green. The UTS Alumni Green is constructed entirely over structure - the university's Multi-Purpose Sports Hall in the east and the underground Library Retrieval System (LRS) in the west. It is essentially a giant urban roof garden. In order to allow trees to be planted in the new Alumni Green, a 600mm high datum was created through the centre of the site to create sufficient soil depth for planting. This challenge was coupled with the need to ensure that the LRS, containing up to 1 million books and located directly beneath The Green, was well protected from any risk of moisture or water reaching the storage vault. This required extensive collaboration with the structural engineer, LRS architect (Hassell) and contractors to ensure that loads on the structural slab were minimised and the water proofing system would withstand the construction of the Alumni Green above. However, the creation of the 600mm high datum served a dual purpose - also allowing the creation of the generous and continuous 'sticky edge' or sculptural seating edge that wraps around The Green. The height also separated The Garden from primary circulation routes, allowing it to become a peaceful, enclosed and green oasis. - Social Sustainabilty - Flexibility of use. The design provides a multitude of opportunities to bring people together, providing infrastructure for study, research and innovation. 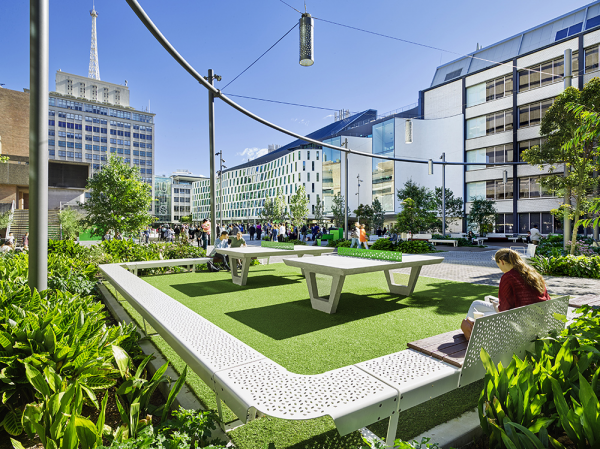 The open sun-filled turf ‘Green’ opens outwards for events and passive recreation alike whilst the comparatively cool and shaded ‘Garden’ provides respite on warmer days. - Careful selection of plant and tree species based on site micro-climatic conditions and solar access and to minimise urban heat island effect. - Diverse selection of understorey plant species. - Collection of rainwater from adjacent building roofs for use in irrigation of the Alumni Green. - Selection of robust, simple materials that are appropriate to the space and able to withstand volumes of users over a long period. - Collaboration with local, Australian manufacturers to produce custom furniture and paving elements for the Alumni Green.